I love having a combination of tree ornaments that are the same (a scattering of the same gold glitter stars) and some that are totally different (like having one roller skate, etc.). 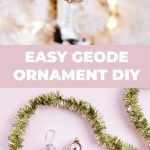 I always like to make at least one DIY ornament for the tree (I still use these diamond ornaments), and this year I saw some pretty geode ornaments at the store and thought that a set of those all in the same color would be a really pretty addition to our Christmas theme. I found some really pretty lavender geodes online, and it only took a few minutes to make them into hanging works of art! Use a craft brush to paint the back of each geode with the gold paint. I also brought the paint forward a bit on each one to create a gold rim around the sides as well. Take your brass wire, and starting 1/2″ down the end of the wire, bend it around the shape of your stone (start at whatever corner you want to be the top of your ornament). When you get back up to the top again, bend your wire into a hook, cut the wire with your pliers, and wind that 1/2″ tail you left at the beginning around the bottom of the hook to secure the sides together. Since your geode is wrapped in wire but only loosely, slide the loop up a bit, dot a few spots of glue where the wire was sitting, and then slide your wire back in place onto the glue spots. Allow the glue to totally set, and then get ready to hang your pretty stones! Credits//Author + Photography: Laura Gummerman. Photos edited with the NEW A Beautiful Mess actions. LOVE this! These would make a pretty gift. But I really came to the comments to ask about your pliers and wire cutter! Are they wrapped in washi tape? Something else? I’ve been trying to figure out how to integrate some of my ugly/bland-looking tools and supplies into my studio. These look so good with a white tree! This year we have a green tree up, but next year I’ll make sure to get a white tree just for this DIY! Is it just me or would these also make adorable earrings with a little tweaking?! Oh I love this! It is so pretty! Gorgeous! This are amazing and so unique! It’s strange but I really like it! My mother-in-law LOVES geodes. I need to forward this to her! Thsi is so cute. Great DIY. This is a great idea! This would even work for my fellow crystal lovers out there! This is so beautiful! What a creative and amazing idea. Well these are just the prettiest! Major heart eyes! This is seriously adorable – and I love how you decorated the tools as well! How beautiful and precious, I totally love those! They look so pretty! And they’re so easy to do! This is gorgeous! I would love to someday have a tree with nothing but crystals and geodes! Awesome DIY once again. 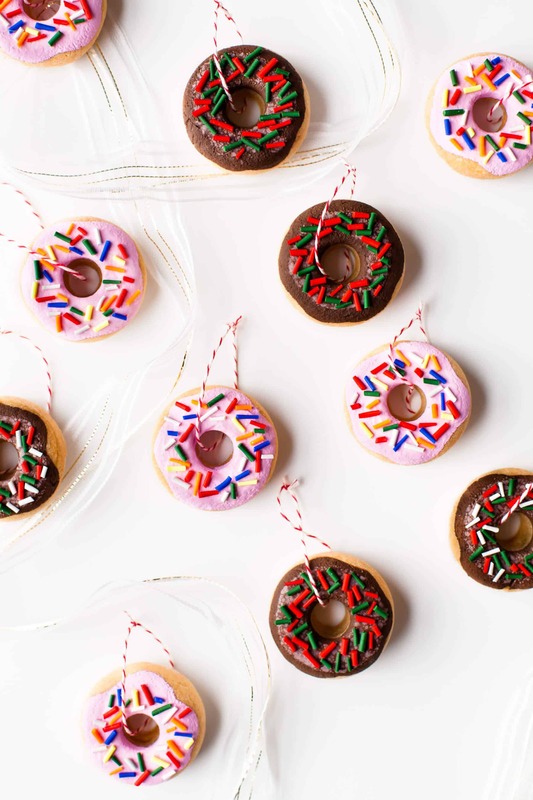 I love these so so much!Pinned this so I remember to make next year! I can’t even get over how perfect these would be in my living room!